Dry oiliness, much more spiciness, some butterscotch. Opens up considerably with a drop of water. This is honestly one of my favourites to date. I love the fullness of it and it’s rich and super complex. It does open up considerably with a hint of water, and it’s one of those that I love in my nose almost as much as I love it on my tongue. It’s like a strong passionate kiss, warm and full bodied and giving it the full amount of love. It’s the one scotch my husband will drink with me and he loves it’s complex notes as well. I’m an islay kinda girl: Give me peat, seaweed and creosote by a beach fire!!! 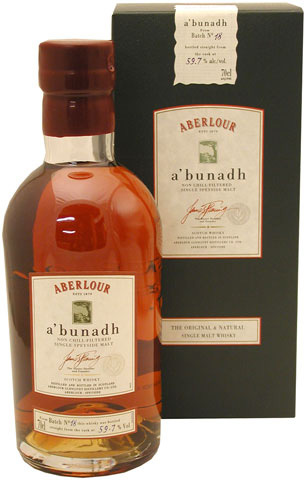 I recall shaking my head when my husband came home with Aberlour A’bunadh. A Speyside? Really??? Then I “drammed”… Slightly oily, sort of like an Islay, a bit of spices, some heat, full and rich! Hmmmm, not bad, not bad at all I thought, we may have to get another bottle! 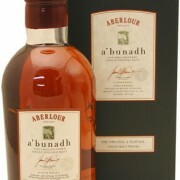 Fantastic dram, I often recommend it to friends looking to buy something “nice” as a gift for a whisky drinker.